Pashinian, a former journalist turned politician, has tapped into public anger over widespread poverty, high unemployment and rampant corruption in the landlocked former Soviet nation of 3 million that borders Georgia, Azerbaijan, Turkey and Iran. His fiery rhetoric and easy style have helped cement his popularity. Opinion polls have indicated that Pashinian’s My Step alliance is set to sweep the vote, while the Republican Party that controlled the old parliament is trailing far behind. The protests in Armenia erupted in April when Serzh Sargsyan, who had served as president for a decade, moved into the prime minister’s seat, a move seen by critics as an attempt to hold on to power following a constitutional reform that had shifted most power to the prime minister’s office. Thousands of protesters led by Pashinian thronged the center of the Armenian capital, forcing Sargsyan to step down days later. The former president has kept a low profile and his Republican Party has largely remained on the defensive, reluctantly submitting to Pashinian’s demand to hold early parliamentary elections. During the monthlong campaign, Pashinian has blasted members of the old elite as corrupt and pledged to revive the economy, create new jobs and encourage more Armenians to return home. The Republican Party shot back at Pashinian, criticizing what it described as his populist statements and divisive rhetoric. “Pashinian has been unable to solve social problems, so he has turned to making shows,” snapped Eduard Sharmazanov, a Republican Party member who served as deputy speaker. On Friday, an Armenian court put former Armenian President Robert Kocharian in custody on charges linked to a police crackdown on a 2008 protest. Armenia has been weakened by an economic blockade stemming from the conflict over Nagorno-Karabakh, a region of Azerbaijan that has been under the control of ethnic Armenian forces backed by Armenia since the end of a six-year separatist war in 1994. Both Azerbaijan and Turkey have closed their borders with Armenia over the conflict, cutting trade and leaving Armenia in semi-isolation. The country has direct land access only to Georgia and Iran. About one-third of Armenia’s population has moved to live and work abroad and remittances from those who have left account for around 14 percent of the country’s annual GDP. “We want the emigration to stop and a wave of repatriation to come instead,” he said. Armenia is highly dependent on Russia, which provides loans and serves as the main source of imports and the top export market. Russia has a military base in Armenia and sees relations with Yerevan as strategically important. Pashinian has pledged to maintain and strengthen ties with Moscow. 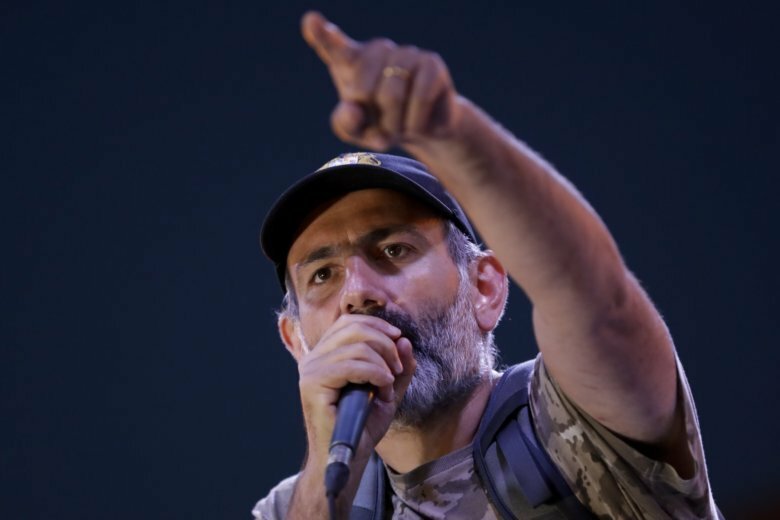 The Kremlin, which resented the protests that swept out unpopular leaders of other ex-Soviet nations in the past, has responded calmly to the abrupt change of power and has sought to establish a dialogue with Pashinian. Kate de Pury and Vladimir Isachenkov in Moscow contributed to this report.